Note: This includes some discussion of the third season of House Of Cards. With Netflix’s release of season three of House Of Cards, America welcomes back one of our most enduring archetypes: the scoundrel president. Kevin Spacey’s villainous Frank Underwood spent the entirety of the show’s first two seasons scrambling up the ladder for political advancement, finally achieving the highest office in the land through a complex series of schemes involving manipulation, lies, and outright murder. However, if Underwood seemed invincible in previous seasons, he has proven all too human in season three, reaching the presidency only to realize that the obstacles to becoming president are nothing as compared to the obstacles to being a good president. If there is one thing that all precincts of the American polis can agree on, it’s that our real-world political system is severely dysfunctional, if not completely broken. It’s not simply that neither political party is able to carry out a coherent legislative agenda—either reform conservatism on the center-right or reform progressivism on the center-left—but that these parties are unable to reach consensus compromise due to the centrifugal pressure exerted by ideological extremism. (Of course, formulating the problem in those terms implies a false equivalency that isn’t really present in reality—the ideological right so far exerts a far more powerful pressure than the ideological left.) Given this, the appeal of a character like Frank Underwood isn’t hard to understand: We (the body politic of these divided states) want an operator, someone who knows how to pull the levers of power and get things done, even if the proper leverage requires a degree of ruthlessness that isn’t for the squeamish. This is why Lyndon B. Johnson—or at least the early Johnson of the Civil Rights Act, not so much the later, diminished Johnson of Vietnam—grows in estimation in many eyes, the last avatar of a professional political class able to achieve noble ends in the face of impossible odds. We like Frank Underwood despite the fact that we are also privy to his every moral lapse and act of monstrous criminality. One of the notable conflicts of the third season raged between Frank’s reflexive ruthlessness and the dawning realization that his continued efficacy as president depends on the assumption of a level of legitimate moral seriousness he has previously only derided from a distance. As awful as he is, we still find ourselves rooting for him, not just because audiences respond to the articulation of competency in fiction, but because we need to believe that his terrible means are justified by noble ends. But as compelling a character as Underwood may be, he is still ostensibly bound by the laws governing the presidency in a world recognizably similar to our own. His criminal acts are clearly demarcated as such, and even he is constrained by quotidian concerns such as popularity polls and reelection bids. 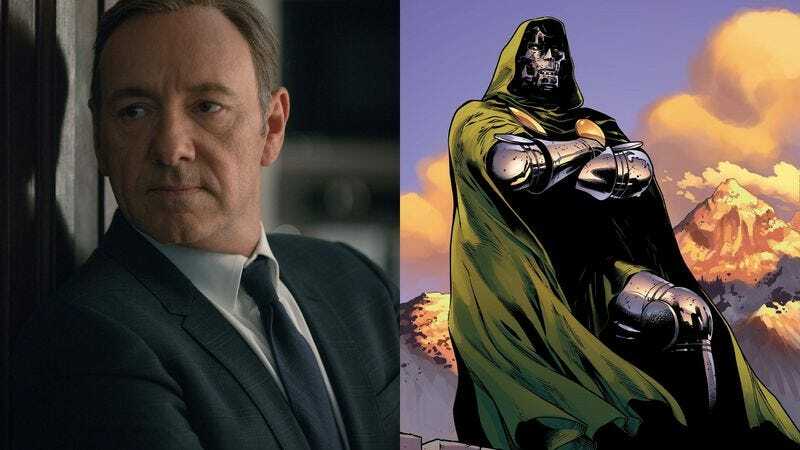 The year 2015 marks the 20th anniversary of comics’ greatest fictional presidency, a brief but memorable term in office even more merciless than that of Frank Underwood: Victor Von Doom, erstwhile supervillain Dr. Doom, who conquered the United States and assumed the presidency in 2099. The mid-’90s was a weird time for comics. After a hugely successful run in the early part of the decade, the market collapsed in 1993 due to oversaturation and a sudden exodus of commercial speculators. Marvel made a lot of money before the bottom fell out, but generally spent this money unwisely. The company spent the next few years on a series of bad business decisions that eventually led to its bankruptcy in the late ’90s. A few interesting things emerged from Marvel’s spending spree. One of these was the 2099 line, a group of sci-fi comics set in the then-far-off future world of 2099. (Now, 20 years later, it’s likely that many people reading this might actually live to see 2099, so maybe not so far-off anymore.) Some of these books were pretty good, and a few of them beat the odds to be pretty great. The conceit of Doom 2099 was simple. This was the same Dr. Doom who had been the 20th century’s greatest supervillain, absolute monarch of Latveria and sworn archenemy of the Fantastic Four. The only difference was context: Whereas in the present Dr. Doom is a would-be world conqueror and tyrant, in the dystopian world of 2099 the same character was a hero and revolutionary. Without a Reed Richards to serve as foil, Doom’s enemies were exploitive mega-corporations and amoral mercenaries. Who wouldn’t root for Dr. Doom against the Koch brothers? Industry veteran John Francis Moore wrote the series’ first two years. He established the future Doom as a noble counterpart to his present-day self, an anachronistic futurist whose gypsy heritage made him naturally sympathetic to the disenfranchised classes in this hyper-capitalist future. He was still utterly ruthless, but set against a crooked oligarchy of rapacious capitalists, he became a hero despite himself. After issue #25, Moore was replaced by a lesser-known British writer named Warren Ellis. With a handful of U.K. credits to his name, Ellis crossed the Atlantic and began his American comics career with unheralded runs on second- and third-tier books such as Hellstorm, Prince Of Lies, Ultraforce, and Excalibur, a chain of assignments representing the ’90s comic-book equivalent of old-school dogsbody reporting. Doom 2099 may on first blush have seemed a similarly unrewarding prospect. But within just a few issues, Ellis had revamped not just the book but the entire 2099 line. Ellis’ run begins with Doom’s realization that all of the major problems in 2099 originate with the megacorp oligarchy dominating the planet, most of which are based in the United States—the future government of the United States having been entirely co-opted by corporate lobbies. Doom begins his plan by engineering a coup in the Eastern European country of Makhelastan. Hackers under his pay release documents pertaining to American influence on Makhelastani domestic policy, followed in short order by a currency collapse that inspires mass demonstrations and civil disorder. (These books were written 20 years ago, keep in mind.) In retaliation, the American government moves to liquidate its assets in Makhelastan—as in, releasing necrotoxins that literally liquidate the population into nutrient-rich goo that can be subsequently harvested by megacorps for recycling into foodstuffs. Satisfied that there is no negotiation possible with American intransigence, Doom’s next move is far less surreptitious: He blows up half of Washington, D.C., and takes possession of the White House, reinstating constitutional authority (Section 1 Article 2 presumably having been amended in the subsequent century) and declaring emergency powers in order to combat the corporations. His first order of business is to nationalize these corporations. His second order of business is to declare net access a universal right, enabling citizens of all walks of life equal access to what had previous been solely the province of the rich. His third order is to manufacture floating environmental maintenance platforms to scrub the air and water of two centuries’ worth of pollution. Unsurprisingly, the former oligarchs do not welcome these actions. In short order the cabal of surviving corporate heads (after Doom killed one or two to make his point) conspire to release a cache of forbidden technology to destabilize Doom’s regime and demolish his private military. Doom’s revolution forces the corporations to accelerate their exploitive timetable: As a result of Doom’s interference, they agree to put a five-year timetable on completely draining the Earth of every resource as a prelude to leaving a demolished planet behind for the stars. Unfortunately, as strong as Ellis’ run may be, it suffers from a tragically weak third act. After the corporate cabal moves against Doom, the series suffers from inconsistent art and the imposition of editorially mandated crossovers. The last few issues wrap up Ellis’ threads in a perfunctory fashion before succumbing to an ill-advised time-travel crossover that precipitated the end of the 2099 imprint. Ellis’ Doom is a tyrant who institutes martial law because the alternative of allowing corporate rule to continue represents a far more grievous danger to individual liberty. Because the America of the future is so unambiguously terrible, we root for Doom to save the country from its own worst impulses—impulses the subsequent 20 years have proven to be not the least bit far-fetched. In the face of systemic corruption and governmental dysfunction, there lingers the temptation to succumb to the charms of a dangerous autocrat—just like Frank Underwood—whose naked personal ambition marks a refreshing change from an ineffective political machine.